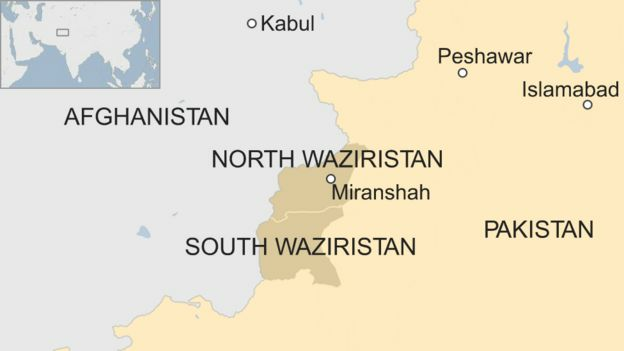 For over a decade the inaccessible and mountainous tribal area of North Waziristan was home to a swirling array of violent jihadists. The Pakistan and Afghan Taliban movements, al-Qaeda and less well-known militant outfits such as the Haqqani Network used the area to hold hostages, train militants, store weapons and deploy suicide bombers to attack targets in both Afghanistan and Pakistan. Today the militants have gone. Virtually the whole of North Waziristan is in Pakistani army hands. The army believes the defeat of the militants was one of the most successful anti-jihadist campaigns the world has yet seen. In two years of fighting the army lost 872 men and believes it killed over 2,000 militants. “Before 2014 North Waziristan was a hub of terrorist activities,” said General Hassan Azhar Hayat, who commands 30,000 men in North Waziristan. After the army moved in “those who resisted were fought in these areas… the complete agency was cleared”. But many militants managed to escape, slipping across the border to eastern Afghanistan to fight another day. Many are now operating there with impunity, some helping the Afghan Taliban in its battle against the government in Kabul while others attack targets in Pakistan. The latest group to establish itself in the area is Islamic State, although the degree of control exercised by Iraq-based Abu Bakr al-Baghdadi over his supporters in Afghanistan is unclear. When the jihadists fled North Waziristan they left behind the apparatus that had helped keep their movement in power. Pakistani army officers today jokingly refer to one village, that was home to many senior militant commanders, as the Taliban’s Pentagon, and they describe another where militants were trained as the Taliban Sandhurst. As they moved across North Waziristan, the army found prisons, a media centre hidden under a mosque, bomb-proof tunnels and a huge roadside bomb factory. 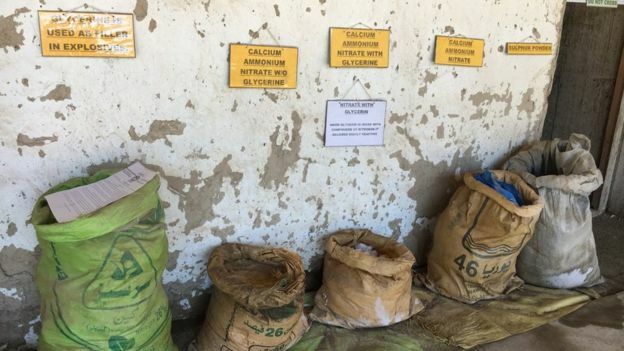 With hundreds of bags of fertiliser and large blue plastic vats filled with foaming chemicals, the facility turned out thousands of bombs that were used all over Pakistan and Afghanistan. The closure of the roadside bomb factory, and others like it, has made a difference. Last year there were 441 violent jihadist attacks in Pakistan. That compares with 2,586 attacks in 2009. Across North Waziristan as a whole, the army found 310 tons of explosives and more than two million rounds of ammunition. For many years, when it was accused of offering sanctuaries to the Afghan Taliban, Islamabad used to argue that it was unable to prevent militants moving into Afghanistan to launch attacks. It was impossible, Islamabad said, to control such a long, remote and porous border over which villagers with relatives in both countries moved freely. 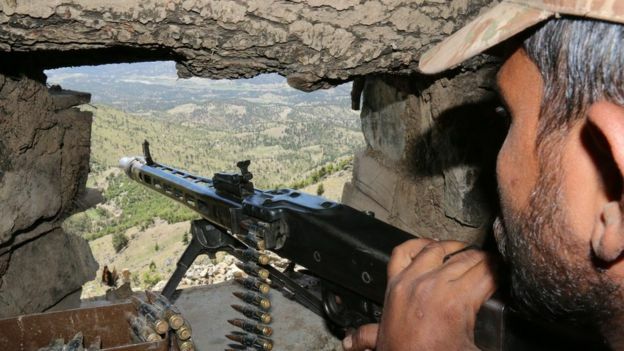 But now it is faced with the mirror situation – Afghan-based militants carrying out attacks in Pakistan and the army trying to control the border. The army says more than 1,000 forts have been built and sophisticated American radar equipment installed to monitor cross border movements. The situation at the border is complicated by the fact that, while Pakistan considers it to be a legitimate international border, Afghanistan has never accepted it as such. The battle for North Waziristan – like those for Mosul and Aleppo – has left widespread destruction. Many homes have been reduced to rubble. There are whole villages where no building has a roof on it. 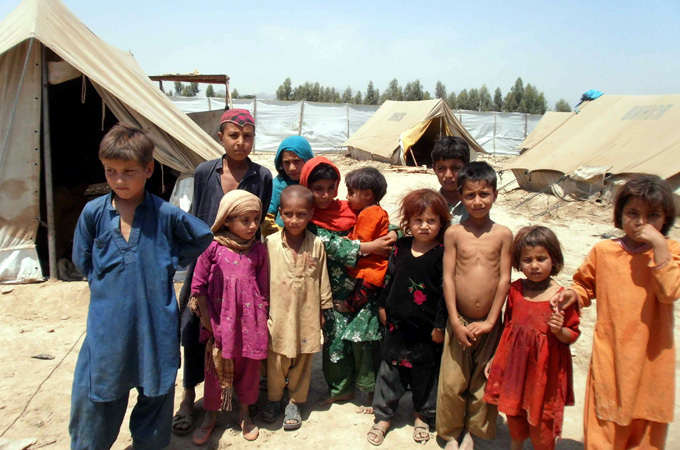 “When we came back we faced the problem of no electricity and water,” said Saifur Rahman, who spent several months living in the nearby town of Bannu during the worst of the fighting between the army and the militants. The army is now building infrastructure to tempt people to return. As well as new roads, there are brand new schools with facilities that rival anything on offer elsewhere in Pakistan. One of the recently constructed and very well equipped schools just outside Miranshah is currently completely empty but has places for 1,000 children when the families decide to return. Jihadist violence is not over in Pakistan. The state is not moving against some of the militant groups that concentrate their activities in Kashmir, Afghanistan and India. And Afghan-based militants from the Pakistani Taliban and other groups remain a potent force. A recent attack on a Sufi shrine in the province of Sindh killed over 80 people. Police in Karachi say they believe the attack was organised by Afghan-based militants. 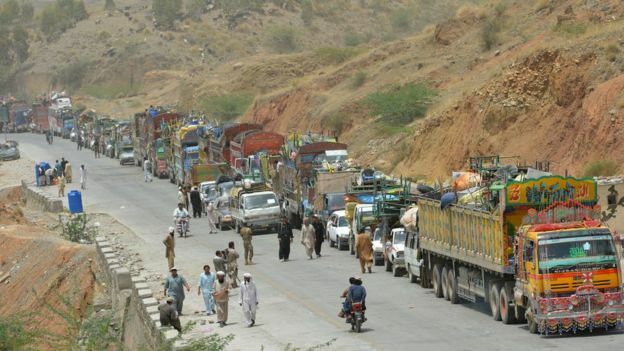 But for all their latent power, the militants in North Waziristan have been repulsed from their stronghold and the tribesmen are gradually returning to resume lives disrupted by conflict. In this respect, the rebuttal of the Shuhada Foundation of Lal Masjid to the claim of TTP-JuA that Lahore Charing Cross attack was perpetrated to revenge the killing of Abdul Rasheed Ghazi is surprising; however, it depicts growing abhorrence for terrorists in our society. Every religious scholar of Pakistan condemned the TTP for this attack by the Shuhada Foundation, which also manages media campaign of Maulana Abdul Aziz, is a major upset for TTP. TTP attributes its genesis of Lal Masjid Operation and it often publishes articles and statements on this issue in its magazines to provoke general public. The outrage of people associated with Lal Masjid against TTP is, therefore, a major defeat of faulty narratives of terrorists in Pakistan. Maulana Abdul Aziz is a person of dubious character and people under his influence are also not constant in their thinking. In the past, they have been supporting TTP’s terrorism in Pakistan and they allegedly expressed allegiance of Abu Bakr Al-Baghdadi and DAISH. We hope they will adhere to their statement that leaders of TTP-JuA are agents of Indian RAW and they are killing innocent Muslims in their anti-Islam activities in Pakistan. Reportedly, the son of late Maulana Abdul Rasheed Ghazi, Haroon Rasheed Ghazi has also condemned TTP’s terrorism and has asked for a political settlement of issues in Pakistan. Such statements are positive omens and reflect that the space for violent extremist Jihadi narratives is even shrinking in religious groups. The nexus of Al-Qaeda, DAISH, and TTP has killed 55 thousand innocent Muslims in their terrorist attacks in Pakistan so far in the name of Jihad. Militant leaders like Fazullah, Mohammad Khorasani and Ahsanullah Ahsan with their unholy hearts and evil minds defend their attacks like that of Army Public School of Peshawar and that of Bacha Khan University in which only little children and students were brutally massacred. Pakistan’s military and civil high officials strongly condemned the attack and recent terror attacks by pointing out their connections in Afghanistan. It is notable that as part of the dual strategy, CIA, RAW, and Mossad are in connivance with the Afghan intelligence agency, National Directorate of Security (NDS) and other terrorist groups. With the latest capture of six NDS supported terrorists in Balochistan, the number of NDS backed terrorists arrested and killed by Pakistani intelligence agencies has crossed over 126. These external secret agencies are particularly supporting the TTP which is hiding in Nuristan and Kunar provinces of Afghanistan. Reportedly, Mullah Fazlullah led TTP is behind the fresh wave of terror activities inside Pakistan, as the latter has also become the center of the Great Game owing to the ideal location of Balochistan. These intelligence agencies, especially Indian RAW is trying to damage the China-Pakistan Economic Corridor project. Gen. Javed Bajwa had called Gen John Nicholson, commander of the US’s Resolute Support Mission in Afghanistan to protest continued acts of terrorism in Pakistan perpetrated from Afghanistan, saying that they were testing Pakistan’s policy of cross-border restraint. d carrying out the Feb 13 suicide bombing on a protest at Lahore’s Charing Cross belonged to Afghanistan. Sharif also announced the arrest of the facilitator of the attacker, Anwar-ul-Haq who he said belonged to Fata’s Bajaur Agency which neighbours Afghanistan. The suspect’s confessional statement was aired during the briefing. The suspect stated: “I was associated with Jamaat-ul-Ahrar and they trained me”, adding that he has visited Afghanistan around 15 to 20 times. Daesh, India-Israel-Mossad -RAW Propaganda Againsty Pak Army & ISI, India-US-TTP-Afghanistan-russia Axis, ISIL, Mossad.ISIS, RAW, TTP, TTP-JuA.Target Pakistan. The two leading US think tanks namely ‘Hudson Institute’ and the ‘Heritage Foundation’ have advised the Donald Trump administration to adopt tough measures against Pakistan. In their view Pakistan is not doing enough in controlling terrorism and is making its soil available for export of terrorism into Afghanistan, thereby threatening the US vital security interests in the region. They have suggested a critical review of intelligence on Pakistan’s involvement in supporting terror since in their view the previous administrations have been taking a lenient view. In their estimation, Pakistan is not an American ally and has been playing a double game by cooperating occasionally and partially. In their recommendations they have stated that Pakistan must be firmly asked to fully share the US counterterrorism objectives, end its support to the Afghan Taliban and Haqqani network (HN) and given stern warning that failure to do so would deprive it of the status on non-NATO ally within six months and result in declaring Pakistan as a State sponsor of Terrorism. In their assessment, China and Gulf Arab States share the US concern about Pakistan’s tolerance of terrorist organizations/individuals. They hasten to add that Pakistan being an important country should also be induced by offering a mutually beneficial trade and investment package, while continuing humanitarian and social assistance programs. It is a well-known fact that there are 1984 think tanks in USA with 350 in Washington. Both Heritage and Hudson are among the 50 most influential think tanks. Other important ones are American Enterprise Institute, Centre for Security Policy, Foreign Policy Research Inst, Institute of Foreign Policy Analysis, Brookings Inst etc. These institutes are required to provide research solutions to a variety of world problems and then lobbying for policy changes. Perceptions are built and the US policy makers influenced to formulate foreign policies or make changes in policies, and frame responses to external challenges. These intellectual institutes are however mostly controlled by the Far-Right Zionist lobby which is pro-Israel and guided by American Israeli Public Affairs Committee (AIPIAC). Of the 30 top executives of the major think tanks, 19 are Jews (63%), whereas Jews are mere 2% of the total population. 94% of American Jews live in 13 key Electoral College State, who play a predominant role in the election of US president. Zionist lobby is closely aligned with Indian lobby in USA. The two lobbies besides having influence over think tanks and media, also have strong influence over the US Congress and play a big role in the election of each member. It is therefore quite logical to assume that like hundreds of anti-Pakistan reports dished out by the US think tanks, US Congress, New York Times, Washington Post and Voice of America, this report was also manufactured by these lobbies that are hostile to Pakistan. Purpose is to influence the new administration to pursue old policies to keep Pakistan in the dock. Rather than focusing on foreign policy and security issues, these think tanks work on tutored themes and burn midnight oil in justifying the crimes of USA, Israel and India against humanity, painting the targeted Muslim countries particularly the radical groups in black and blaming the victims of aggression as terrorists or sponsors of terrorism. Pakistan has been the biggest victim of Indo-US-Israeli propaganda since 2005. Since none of the sinister objective against Pakistan could be accomplished through covert means, the propaganda continues unabated and this report is in continuation of the malicious campaign. Whether their counsels helped USA in winning the war on terror, or at least in improving their image. If not, have they ever prepared a paper highlighting why the US has failed to achieve its stated and hidden objectives after fighting the longest war in its history and spending over $ 1 trillion, where the US went wrong and how could it make amends to restore its lost prestige. (I have). Instead of the next door neighbor Pakistan feeling insecure, how come the US located 7000 miles away and across the seven seas feel threatened by the chaos in Afghanistan which it had intentionally created? I want to know as to what are the accomplishments of the US-NATO forces and in what way they have fared better than Pakistan to ask it repeatedly to do more? In my reckoning, the US need to do a lot more. Can the US deny that CIA in league with RAW, NDS, MI-6, Mossad and BND been exporting terrorism into Pakistan since 2003 with the help of its proxies created in FATA, Swat, Baluchistan and Karachi? Can it deny that RAW and NDS are still supporting them? Why the ISAF withdrew bulk of 1, 30, 000 troops from Afghanistan in December 2014 without eliminating its principal objective of eliminating terrorism? Was it because of resurging Taliban power which it couldn’t defeat, or the sagging morale of ISAF soldiers due to mounting war casualties, suicides, in-house attacks, huge number of post stress disorder cases and uninspiring military leadership? Isn’t it true that the morale of occupying forces drawing handsome salaries drooped because they had no cause and that they were fighting a wrong war for selfish motives of the elites? When the US accepted in principle that the Taliban could neither be defeated on the battlefield nor cowed down and decided to quit Afghanistan by December 2014, what was the need for keeping behind a token force along with airpower? Did it really expect that what the combined military force of 48 countries couldn’t achieve, would be accomplished by ANSF rived in so many discipline problems? Isn’t it a fact that rather than accepting defeat in good grace and quitting honorably, the US military brazenly blamed Pakistan for all its failures? Can the prestige and honor of the sole super power be restored by making Pakistan a scapegoat? 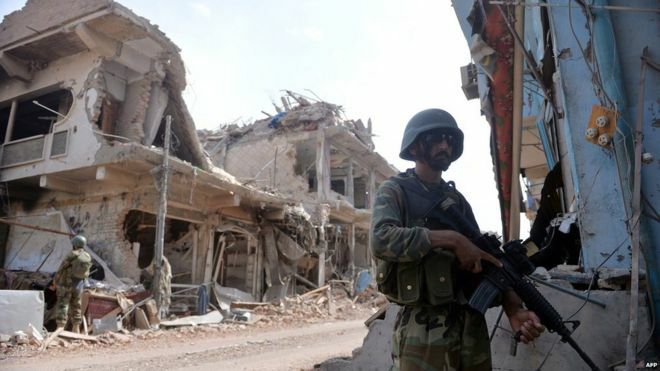 Pakistan security forces and ISI on the other hand successfully broke the back of terror network and demolished all the sanctuaries, communication and command infrastructure from FATA and settled areas of Khyber Pakhtunkhwa, enfeebled foreign backed separatist movement in Baluchistan and demolished the militant structure of MQM in Karachi. All this was done single-handed against all odds and astounded the world. USA is among the ones acknowledging Pakistan’s spectacular successes. If Pakistan had fought the war with ill-motives and without a genuine cause, could it have achieved the miracle? It is now an open secret that the US had occupied Afghanistan under a preconceived design and with sinister objectives against Pakistan and other regional countries. It has been calculatingly inflaming terrorism in the region and particularly in Pakistan and at no stage made any sincere effort to quash terrorism. Had the US been sincere and serious in eliminating terrorism as professed by George W. Bush and his successor Barak Obama, it would have made Pakistan its strategic partner and banked upon it based upon its astounding performance in the war against the Soviets in the 1980s. The US relied upon India which has nothing in common with Afghans and is a far distant neighbor. Driven by acute animosity against Pakistan, India kept pressing US military to focus on Pakistan rather than on consolidating its gains in Afghanistan. Gen Mc Chrystal, Gen Petraeus and former Secretary Defense Chuck Hegel publically declared India as a problem child. Wasn’t it a big mistake on part of the US to sideline the Afghan Pashtuns that are in big majority, and instead rely upon minority Tajiks, Uzbeks and others in Northern Alliance and unpopular and inefficient regimes of Karzai and of Ghani? One may ask as to why the US has been striving hard since 2011 to have dialogue with the Taliban who are supposed to be the foes and are still vying to make them agree to talk? And why Pakistan is being asked to stay away from them? Concept of good and bad Taliban is the brainchild of USA and not of Pakistan. In its view, all those agreeing to talk are good and those refusing to talk are bad. Since 2008, the Taliban are constantly gaining ground in Afghanistan and are striking targets in all parts of the country including Kabul and northern and western parts. Their resurgence became menacing after 2014 and coming spring offensive will prove highly perilous for the unity government in Kabul and for the 3, 50,000 ANSF supported by 12000 Resolute Support Group that have failed to stem the tide. So how come Pakistan is responsible for their dismal performance particularly after it cleared the last stronghold of North Waziristan in 2014 where HN was based? The US has been suspecting and distrusting Pakistan from the outset since it was never made an ally. Marked as a target, friendship was a ruse to deceive Pakistan, make it complacent, weaken it from within through covert operations and then extract its nuclear teeth at an opportune time. This feat if achieved would have justified its most expensive Afghan venture. So who has been playing a double game?? Rather than learning lessons from past mistakes and blunders and taking corrective measures by working out a face saving formula, the two think tanks have suggested the same old remedy which will prove counterproductive. Pakistan has been kept on the leash all these years. So, what tough measures are now being suggested? The threat of declaring Pakistan a terrorist state, or to make the financial assistance condition based, or drone war are coercive tools in use for over a decade. What is so new suggested by the sages and that too at a time when Pakistan has weathered all the pains, its armed forces are fully battle inoculated and have proved their mettle, its nuclear and missile programs are vibrant and in safe hands, it has overcome its energy and economic crisis, it is no more isolated, it is a coalition partner of ascending power and has other options as well? On the other hand, USA is a declining power ruled by controversial, unpredictable and unpopular president, annoying everyone including the Americans other than the most detestable Israel and India. How has the Trump administration responded to Iran’s tough response? It is on a weaker wicket to threaten nuclear Pakistan.